Decide on a piano budget you can afford: you don’t want your piano to represent guilt or hardship. Consider the appearance and type of piano you want: a piano is not only an instrument, it can be a substantial piece of furniture. When you find one that’s looks good, it’s time to try it out. Be ruthless, try every note, every style, every volume. Play all different kinds of music: some that’s loud and fast, and some that’s soft and slow. If you don’t play yourself, bring a friend along with you to the store who does. Remember, you might not fall in love with the first one you see, but with a little time you’ll find the piano that you’re meant to be with. Do you want an upright or grand? What color and look do you want from your piano? Will you buy your piano privately or through a dealer? What kind of warranty does the piano come with? What kind of after sales service does the piano have? What does the piano ‘sound’ like? If you’re not yet musical, bring someone with you who can help. How long have they really been in business? – Some Piano stores claim that they have been in business for years but have only bought the piano name from someone else, usually someone closing a failing business. This means buying from someone with no understanding, experience or involvement in pianos. Are they going to continue to be in business? – Are they doing well? Do they own their premise or are they renting? How old is the owner of the store? How much do they know about the business? What is their overhead like? What is their warranty like and more importantly, are they going to be around to fulfill it? Do you trust they will do a good job if something goes wrong? What is there reputation like? Can they give you any testimonials? Do they have their own repair shop? Do they employ trustworthy and experienced craftsmen? How do they make you feel? Are they genuinely interested in pianos or is it just a business? Contact a reputable piano restoration company to do an inspection. Make an allowance of $250 to $1000 for repairs and transportation. If buying from a friend or colleague do not assume it is a good instrument. They may not know. Pacey’s Pianos can perform the inspection, make moving and tuning arrangements, and can even perform the negotiations. We’ve got the expertise you can trust. Contact Pacey’s Pianos to find out more about our inspection service. Sites like lotsofpianos.com or craigslist offer lots of variety but it is buyer beware. Never buy at auction! A convenient way for dealers and general members of the public to reduce their undesirable inventory is to sell it at auction. The vast majority of pianos as auction require significant repair and refurbishment. Buying from a reputable dealer is the safest way to purchase a piano. Many give good warranties with their pianos and peace of mind is something that should be considered. 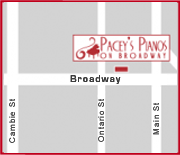 At Pacey’s Pianos, we have tradition, experience, skilled staff to make your purchase easy and we’re devoted to giving you customer service as outstanding as your piano.